The Omni Los Angeles at California Plaza is located in the heart of downtown Los Angeles financial district atop prestigious Bunker Hill. This Four-Diamond luxury hotel offers warm hospitality and sophisticated elegance to both business and leisure guests. All guest rooms are attractively furnished and offer plush triple-sheeted beds with fluffy duvets. For guests desiring the utmost in attention and privacy the hotels club level rooms provide keyed elevator access and entry to the private club lounge offering complimentary deluxe continental breakfast and evening cocktails with hors d oeuvres. Los Angeles fine dining is showcased at Noe Restaurant where Chef de Cuisine Simon Warren presents modern American cuisine with a flair for the Asian and French fusion. The casual Grand Cafe offers innovative California cuisine overlooking the Museum of Contemporary Art. The hotel is within walking distance of city hall and municipal and federal courts. The citys cultural district with the world famous Walt Disney concert hall, the Broad Museum, Ahmanson Theatre, Dorothy Chandler Pavilion and the Mark Taper Forum are just steps away. The Los Angeles Convention Center and Staples Center are 10 blocks from the hotel. Los Angeles International Airport is a 30 minute drive. Four-diamond luxurious comfort embraces style. Hotel is 100 percent non-smoking. Welcome to Omni Hotels and Resorts. The Omni Los Angeles is part of the California Plaza Complex featuring offices as well as shops and restaurants. Located in the prestigious Bunker Hill neighborhood the hotel is adjacent to the Museum of Contemporary Art and is 2 blocks from the Walt Disney Concert Hall, the Broad Museum, and the Dorothy Chandler Pavilion. The hotel is in the heart of the bustling business and financial districts as well as the government center of the city. The colorful jewelry and fashion districts are nearby. The Los Angeles Convention Center and Staples Center are 10 blocks away. The hotel offers convenient access to Interstates 5 and 10 and 110. The subway stops at Pershing Square just 2 blocks from the hotel. 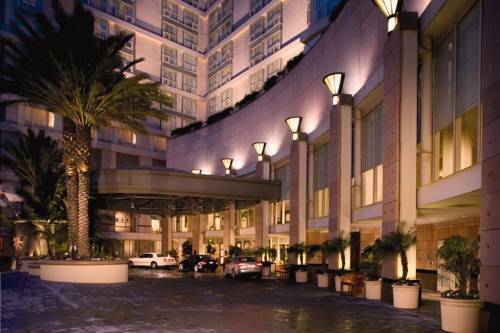 Local shuttle service within a 3 mile radius of the hotel is offered from 0700 to 2300 hours. All of the area airports are within a short drive. All reservations must be cancelled before 12 noon local hotel time one day prior to arrival day to avoid billing. Individual rate plans may have cancellation requirements that vary from the standard policy. Check specific rate description for complete details. Hours: Breakfast 0630-1030 Mon-Fri, 0700-1030 Sat and Sun; Lunch is served 1130-1500 daily. Offers a casually elegant atmosphere featuring innovative California cuisine complete with its own pastry kitchen. Indoor and outdoor dining is available, with views of the reflecting pool surrounded by magnolia trees. Hours are Mon-Thurs 1700-2200. Fri and Sat 1700-2300. Sun 1700-2200. An elegant oasis in the midst of downtown. Features a refined seasonal California menu and an outdoor patio showcasing the stunning downtown skyline. 213-356-4100, www.opentable.com. Reservations recommended. Noe Bar is a tranquil cocktail lounge with live piano music, a full food and drink menu, and a humidor with 12 varieties of quality cigars. An expansive casual patio allows patrons views of Los Angeles. Open Daily from 1500 to 0200. Our coffee bar and gift shop offers an assortment of delicious pastries and desserts, gourmet coffee and a variety of gifts and sundries. Open Daily from 0600 to 2000. Cardiovascular exercise - Services also include Bar Dip and Lifecycles plus Cybex Machines and Sit-up Incline Board. Beverly Center is the premier fashion of Southern California destination with 160 distinctive specialty boutiques reflecting the diverse styles and tastes of Los Angeles, including Louis Vuitton, Gucci, Burberry and True Religion. 1.5 Miles A Los Angeles landmark for history, culture, events, shopping and dinning. Free shuttle transportation from property to city center. Public transportation is not adjacent to the property. City Center is 6 blocks from the hotel. ~2 miles from Los Angeles. ~3 miles from Los Angeles. Founded in 1899, filled with dead celebrities, and reborn as Hollywood Forever, a hybrid working cemetery and tourist attraction. Probably the most fun cemetery in America, with an anything-goes approach to tombstones. Try to be there on Movie Night! ~5 miles from Los Angeles. ~9 miles from Los Angeles.